Our 2 week olds umbilical cord fell off 3 days ago. 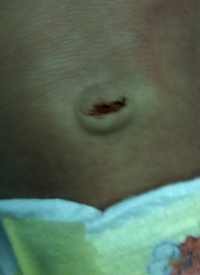 Since then we find a very small amount of dried blood in her belly button each day. The blood is not enough to get on her clothes. Is this normal? Thanks for the umbilical cord cleaning video! This is normal and very common. There are three blood vessels travel within an umbilical cord. As the umbilical cord begins fall off, these blood vessels seem to be the last part to degrade. Sometimes when an infant’s cord falls off one of these vessels will periodically bleed. Given time, the vessel should completely degrade and bleeding should end. If the bleeding increases in amount or lasts more than 2 weeks take your daughter to her doctor. Continue to use an rubbing alcohol on a Q-tip to clean the dried blood as needed.